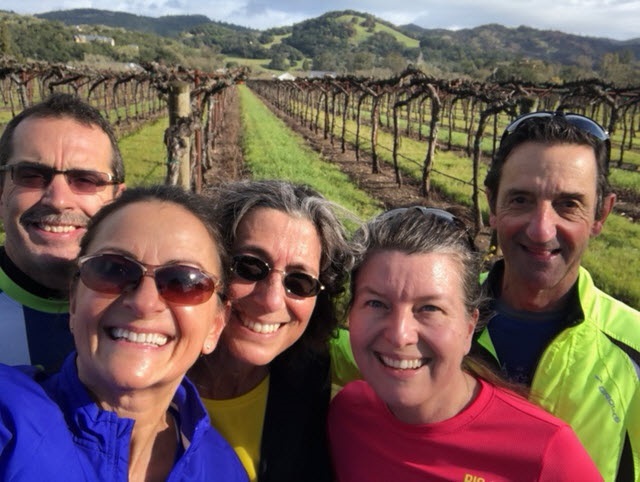 The Napa Valley Marathon was my 51st marathon and I have to say – it’s one of my favorite! We came to celebrate my friend Reggie’s 60th Birthday. The Expo: I’ve been to a lot of Expos, and I have to say that the Napa expo was top notch. It wasn’t huge but it has just the right amount of vendors to make the experience more personable. I’ve never been to an Expo with such an abundance and variety of food; cheese boards, protein bars, cold brew coffee and of course wine & beer tasting. They even had free facials! The merchandise what also top quality. There was a bin with last year’s gear that was on sale for $10.00 each. I walked away with new tights, sweat shirt, tank top and 2 wine glasses from last year’s race. 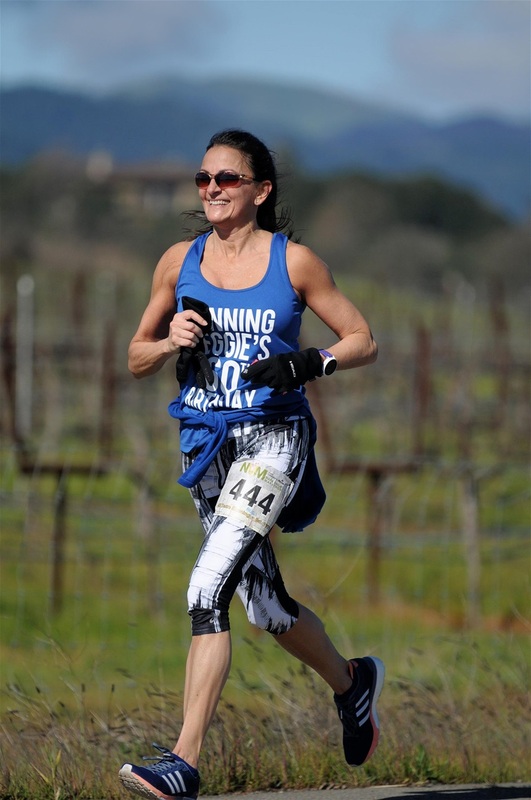 I was pleasantly surprised to find out we get a Napa Valley marathon duffle bag that was to be used as our gear bag. Each bag had a laminate that had our bib number. Shakeout Run: The Saturday morning shakeout run was pretty cool too. We were lucky to have the guest appearance of Joan Benoit! 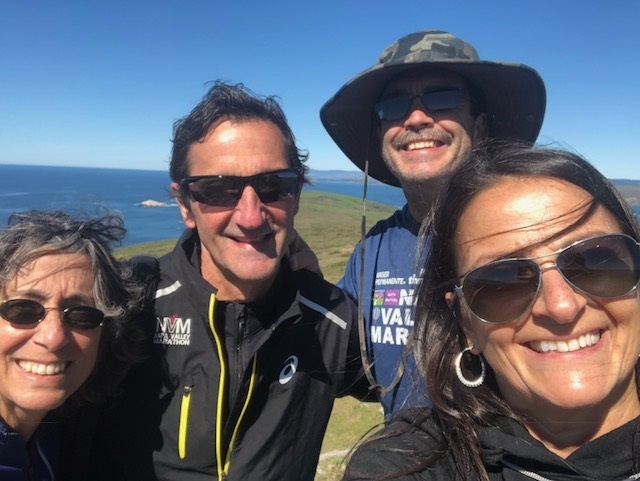 It was a great way to meet other runners and the race director. There was a raffle with some nice prizes too! Pre-Race: Logistics to getting to the race were seamless. The busses pick you up at the high school where you have access to the bathrooms (indoors), and drive you to the start. You can stay on the bus until the race starts to stay warm. The bag check were the busses that we arrived in. Each were visibly marked with a range of bib numbers to quickly drop your bag and head to the start. There were PLENTY of port-o-lets at the start too. (That’s always a plus). The race director kicked off the marathon with some announcement and introduced a gentleman to sing the National Anthem that had done so year after year. I loved how everyone jumped in and finished it with him. The Race: The horn went off and we started running. It was pretty cold at the start (I think around 33 degrees). I had on hand warmers and an extra throw away top. I started to warm up around mile 3 but never got rid of the hand warmers. I loved the course. 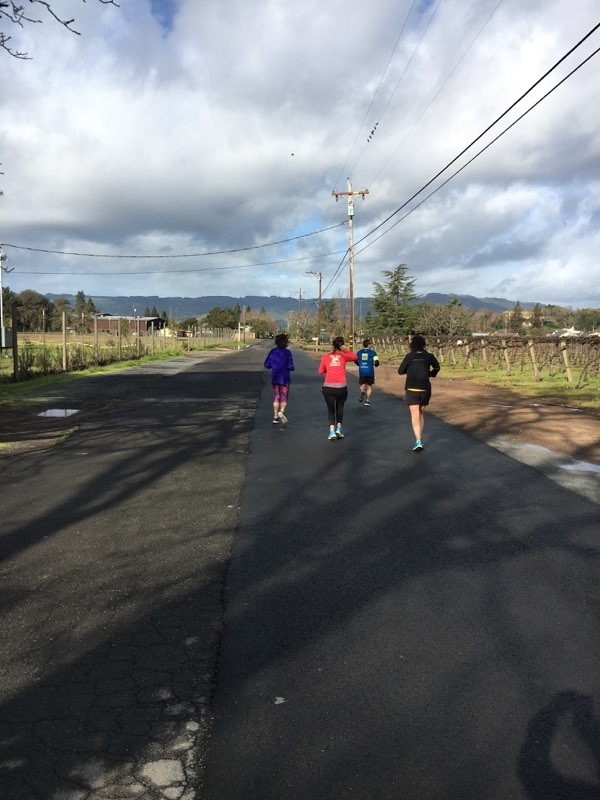 In the beginning there was fog and the sunlight ahead that made the runners ahead appear as silhouettes. There was a lot of windy California roads and every turn was just more beautiful than the first. 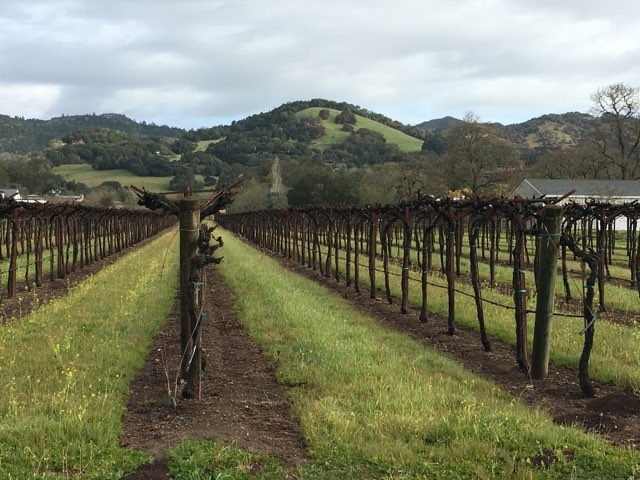 There were so many beautiful well maintained wineries along the way. Some sections of the road had quite the canter so there was a lot of readjusting back and forth to find the best part of the road to run on that wouldn’t be too difficult on the legs. I was lucky enough to see Dean Karnanez on the course. We ran with him for quite a few miles where we exchanged stories. I loved that his wife was on the course supporting him with nutrition. He even offered us food if we needed it. What a great down to earth guy. There were water stops about every 2 miles and plenty of port-o-lets on the course. The higher miles we had choices of honeystinger products. They also had bananas and some of the freshest oranges I’ve ever had. There was not a lot of crowd support but it wasn't missed with all the other distractions. Even though there were a lot of rolling hills I felt it was a fast course. There seemed to be more downhill’s than up hills. As soon as I crossed the finish line we were handed an open water and medal. The young volunteers stayed with us a few minutes and talked to us to make sure we were “okay” and weren’t in any need of medical attention. Post-Race: The post-race at the High School was fantastic. The auditorium is where we picked up our duffle bags. The school was open to let the runners use the facilities for showering and changing. Another great perk was the FREE massages. I got a massage from a young girl that was fantastic. For post-race food we received a bag as soon as we crossed the finish line with a Kind bar and banana. The School café served yummy hot soup and ice cream. I loved the prizes they had for the 1st and 2nd place winners. A HUGE bottle of wine. Does it get any better? They had a nice award ceremony for them that ended with a raffle where they had about 20 prizes. I loved this race. Our group from CT is already talking about coming back next year to do it again. 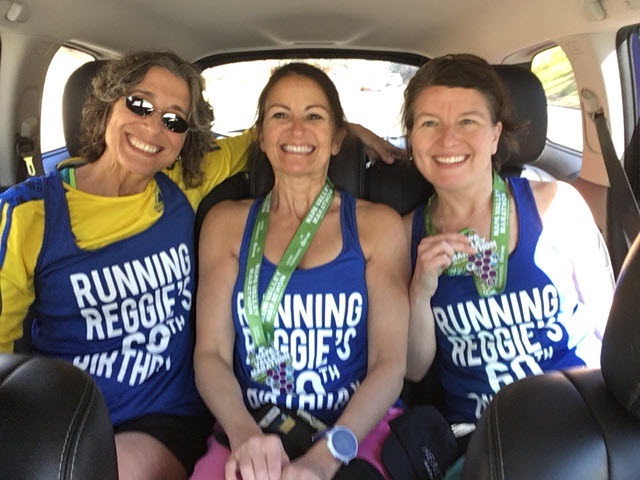 I especially wanted to point out that my friend Reggie said before this marathon “this is my last marathon”, after the race she said “I would definitely come back and run this one again”. Just goes to show you how great it was. It’s pretty refreshing to be part of such a well-organized event. Can’t wait till next year!